While the world's eyes are trained on the 2016 Summer Olympics in Rio de Janeiro, I thought I'd acquaint you with one of Brazil's most delectable grilled meats: picanha. Pronounced "pee-KHA-nyah" in Portuguese, this tender cut of beef is indisputably a carnivorous heaven on earth. Picanha (not "piranha," Spellcheck, despite the Brazilian connection) is beef top sirloin with a thick cap of fat. It is sometimes called rump, rump cover, or coulotte. Not surprisingly, it comes from the back end of a steer, the top of the sirloin primal just in front of the tail. Perhaps you've encountered it in a Brazilian-style steakhouse--a churrascaria like Plataforma in New York City or Fogo de Chão, which has multiple locations in the U.S. It is traditionally crusted with coarse salt, then cooked on a spit and carved to order. 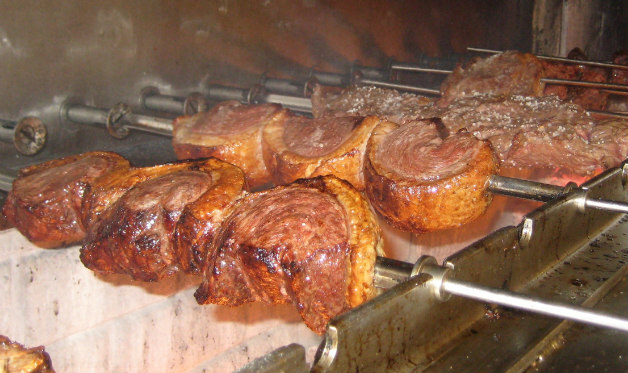 Once the outside slices are served, the picanha is re-salted and returned to the rotisserie for further cooking, then carved again. This way, every eater gets a caramelized and ultra-flavorful end cut. Native to the southernmost state in Brazil, Rio Grande do Sul, picanha is said to be named after the branding irons or cattle prods used by the gauchos (cowboys). But ask a North American butcher for picanha and you'll likely get a blank stare. In the U.S., top sirloin is likely to be broken down into the rump, the round, the loin, or tri-tip. Tragically, most of its luscious fat cap--up to 4 inches--will have already been removed. A proper whole picanha will weigh between 2 and 2-1/2 pounds and have a 1/2-inch fat cap on top. For more tips and a Brazilian picanha recipe, visit BarbecueBible.com.